The First Circuit recently applied an abuse of discretion standard of review to a claim for top hat plan benefits. 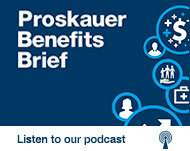 Plaintiff Robert Niebauer, a former executive of Crane, brought a claim for executive severance plan benefits and a claim under ERISA section 510 for interference with his rights to benefits. The district court granted summary judgment in favor of Crane on both claims, finding that the denial was not arbitrary or capricious, and there was no adverse employment action to support his interference claim. On appeal, Niebauer argued that the district court erred and that it should have followed decisions from the Third and Eighth Circuits holding that top hat plans are unilateral contracts subject to ordinary contract principles and that determinations made under such plans should be reviewed de novo. The First Circuit declined to consider whether such a categorical rule for top hat plans should apply. Instead, it ruled that the distinction between top hat and other plans has no meaning where, as here, the plan grants discretion to the plan administrator. According to the Court, the grant of discretion, even under ordinary contract principles, confers a reasonableness standard equivalent to the deferential review standard ordinarily applied under ERISA. The Court also refused to find a conflict-of-interest based on Crane’s alleged desire to retaliate against Niebauer, ruling that such retaliatory intent is properly treated under ERISA section 510. The Court thus affirmed the lower court’s finding that the decision was supported by substantial evidence and therefore was not an abuse of discretion. However, the Court vacated the district’s dismissal of Niebauer’s section 510 claim because it found that the district court improperly applied an abuse of discretion standard of review to that claim. The case is Niebauer v. Crane & Co., 2015 WL 1787931 (1st Cir. Apr. 21, 2015).